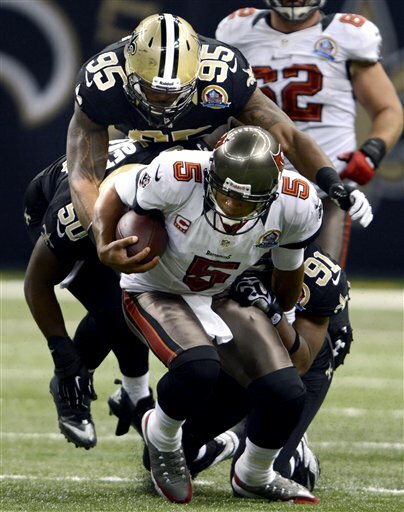 As far as 2012 Saints' football goes, this was about as perfect a week as possible. The past 11 months have been neither enjoyable nor encouraging but, like many things in life, they turn for the better after awhile. In a seeming moment the discontent and disillusion faded, with hope and a promise of redemption assuming their place. So begins the transition to the 2013 Saints' season. In the span of six days, the Saints were vindicated from the injustices of BountyGate; Drew Brees reminded us why he secured a $100 million contract; the defense--once saddled with the infamy of historic futility--delivered the team's first shutout since 1995; backup safeties intercepted two passes; Cam Jordan's steady ascension continued; Mark Ingram made his presence on the field worthwhile; Joe Morgan reinforced his burgeoning relevance as a big-play threat; and the Saints scored over 40 points for the first time in nearly a year. All of those issues, heretofore thorns, anxieties, and uncertainties that pestered, suddenly vanished into irrelevance. Ephemeral or not, this week's reassurances were a refreshing exhalation and a sign that hope reigns. And, of course, Joe Vitt called Mike Cerullo an idiot. But with normalcy returning, and with the hope of next season already on the horizon, one issue--the largest of all--still remains: Sean Payton. Will he or won't he coach the Saints again? 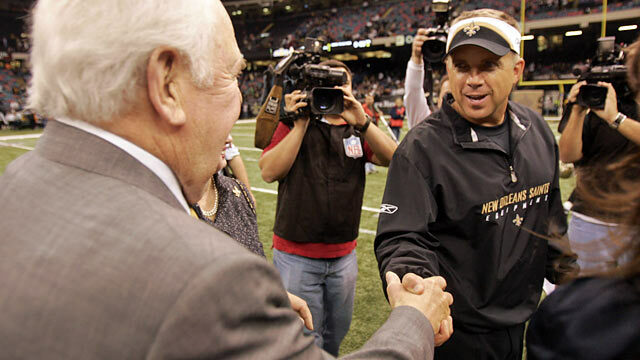 In September 2011 Sean Payton signed a five-year contract extension with the Saints. At some point after that--we don't know exactly when--the NFL decided that a provision in the contract was unacceptable, and subsequently rejected the contract. As a result, when he's reinstated, Sean Payton will no longer be under contract with the Saints. The provision in question (the one the league rejected) enabled Payton to void his contract if Mickey Loomis was fired, suspended, or in any way no longer with the team. This was viewed by some as the "Rita Clause," with Payton hedging against his reservations of working directly with/for Rita Benson LeBlanc. For whatever reason, the NFL saw this provision as unacceptable. After this, it gets--and still remains--exceptionally murky. When exactly did the NFL reject the contract? When did they relay this information to Sean Payton and the Saints? In March 2012 during Sean Payton's BountyGate appeals, Payton inquired (to Roger Goodell) as to the status of his contract extension and at that point, Goodell informed Payton the NFL had rejected the contract. For those scoring at home, that's a full seven months after the contract was signed and submitted to the league for approval. Why did the NFL take so long to make this determination? Why did it take seven months to officially reject the contract based on one simple clause? Further, in the seven months that Payton awaited approval of his extension, were he and the Saints aware of the reason the contract was under review? Were they allowed to re-negotiate during that time period? Did they know what was happening? These questions appear to remain unanswered, and they yet again cast a cloud of suspicion over the NFL. Most important, why wasn't the extension rejected in a timely manner that would have allowed Payton and the Saints to re-negotiate during the 2011 season? And why finally give Payton official notice at a time when he was suspended, and thus unable to resume the re-negotiation process? Was the NFL intentionally obstructing Payton all along? Was this a result of Goodell's personal vendetta against Sean Payton? In the meantime, the Saints fell apart. Payton, without a contract, quickly acquired a massive amount of newfound contract leverage. And so the season's biggest question now remains: will Sean Payton re-sign with the Saints, or will he go elsewhere? Only Sean Payton knows this, and it is completely up to him. By all appearances, Tom Benson has offered to make Payton the NFL's highest paid coach, but that only matters if Payton is willing to return. What we're less sure of--obviously--is what Payton is thinking or considering right now. When circumstances change, so may outcomes. Over a month after Jay Glazer reported that Payton "absolutely plans" (key word: "plans") to return to New Orleans, Glazer then reported (yesterday) that Payton wasn't "going to limit his options." Why the change in tone? Surely this is just agent-speak, but does that make it untrue? There are plenty of reasons the Saints are the logical choice for Payton: his relationship with Drew Brees and Mickey Loomis; an established system and functional roster; widespread community support (does this matter? ); loyalty to the organization and the city (does this matter? ); and perhaps a desire to restore what BountyGate unjustly dismantled. Does Payton want the last word in New Orleans (I think he does, but it doesn't matter what I think), or does he want to start anew? The odds probably favor Payton returning to the Saints. But how can we really know? And if the Dallas job becomes an option? What if Dallas is Sean Payton's dream job? What if Payton has decided that being close to his kids is more important than having an optimal relationship with his QB and GM? What if Payton harbors a tinge of ill-will toward Tom Benson for not more aggressively fighting Roger Goodell on BountyGate? 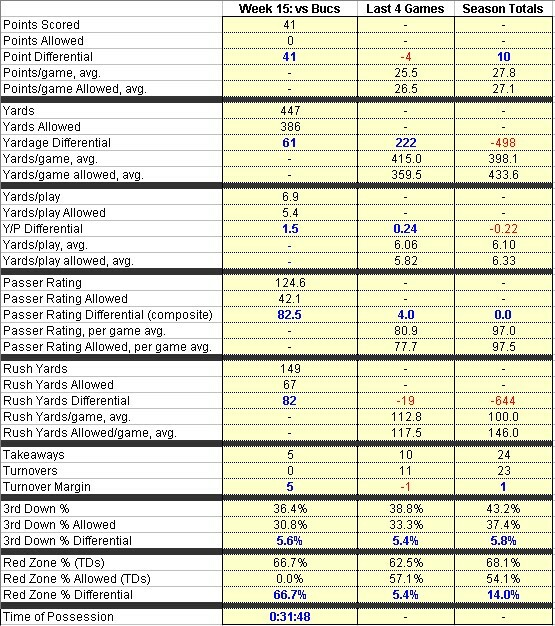 What if Payton's reticence to work with Rita LeBlanc outweighs his hesitation to peacefully coexist with Jerry Jones? What if there are other opportunities besides Dallas that Payton might be interested in? What if Payton simply wants a fresh start in his career? This is obviously all baseless speculation, but it's worth mentioning precisely because Payton remains unsigned. The fact that we're at this point is concerning enough. Most recently? Tom Benson has vowed to sue the NFL should Payton ultimately sign elsewhere. Not a slow moment around these parts, ever. It's been quite a renaissance for Benson these past seven years, and the Payton contract situation is his next big challenge. I guess if the worst case scenario unfolds, we'll at least be treated to the entertainment of Old Man Benson summoning his inner Al Davis. Regardless of what happens, the shame in all of this resides in the nebulous circumstances surrounding the rejection of Payton's 2011 contract. That's what brought us to where we are today. It seems like this should have been resolved well over a year ago. But the NFL dragged it out for some reason. In Days of Thunder, there is a particularly poignant scene in which the two rival drivers are informed by the head of NASCAR of the Chinese Cabbage Theory. In short, when the Chinese do not want a head of cabbage to clear customs, they simply let it wait on the dock for weeks saying they dont have an inspector available to clear it. Finally, when the inspector comes around, the cabbage is rotten and not cleared by customs. Benson has the leverage, and I think Payton knows this, hence yesterday's leak. I'm just trying to figure out who's Rowdy Burns in this scenario.